Music City has a unique, artistic style associated with it. 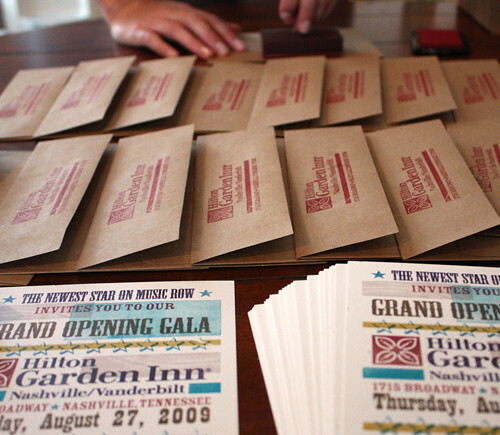 Our latest job involved recreating that look for a grand opening invitation. 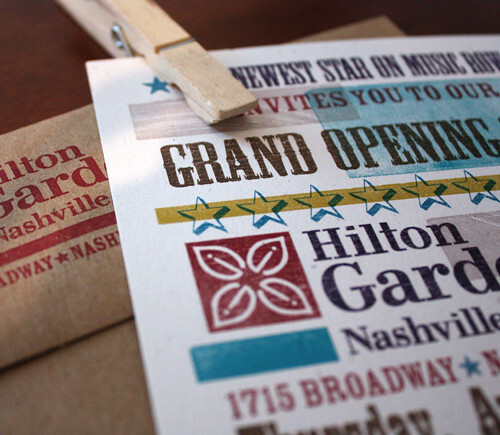 The Hilton Garden Inn opened it's doors a couple of months ago and wanted to celebrate their new location in Midtown. So we created a rustic invitation with lot's of texture on recycled paper. And since we love stamps, the return address fit nicely on the back in a red hue. If you're ever in that neighborhood, check out the hand-painted mural in their lobby - it was created by the Hee-Haw set designer!